On January 18, 2018 the Parliament of Ukraine adopted in full Draft Law No. 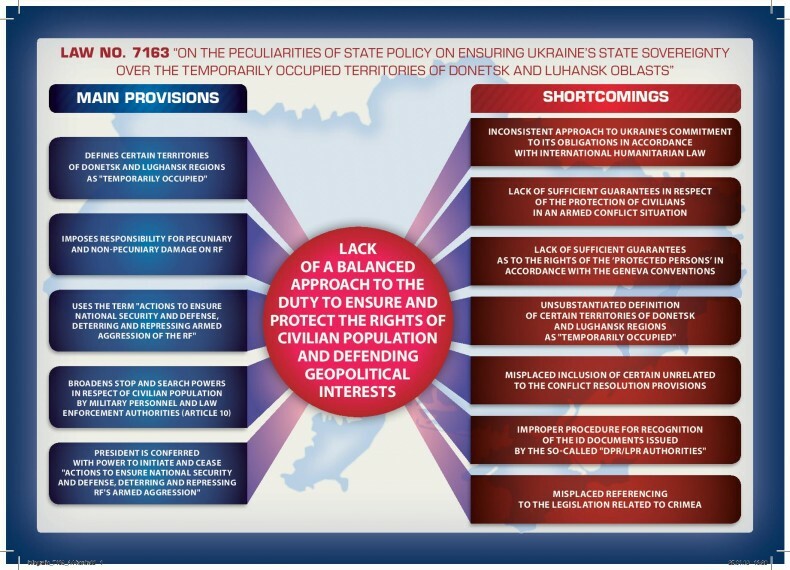 7163 “On the peculiarities of state policy on the restoration of the state sovereignty of Ukraine over temporarily occupied territories in Donetsk and Luhansk Oblasts”. 3) the draft law grants extra powers to the President of Ukraine, Commander of United Forces, and officials involved in measures aimed at ensuring security and defense, as well as at stopping and containing Russia’s military aggression in Donetsk and Luhansk oblasts. Considering the above information, after Draft Law No. 7163 is signed by the President of Ukraine Petro Poroshenko, UHHRU will call for amendments to be introduced to this document in order to adjust it in accordance with human rights standards and international humanitarian law.